Notable features of Graf's game were her versatility across all playing surfaces, footwork and powerful forehand drive. Graf's athletic ability and aggressive game played from the baseline have been credited with developing the modern style of play that has come to dominate today's game. 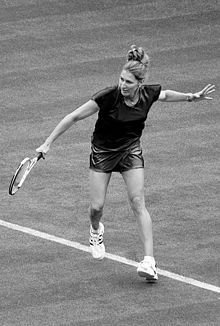 She won six French Open singles titles (second to Evert), seven Wimbledon singles titles, four Australian Open titles, and five U.S. Open singles titles. 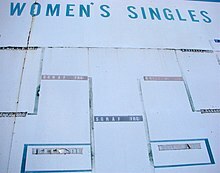 She is the only singles player (male or female) to have achieved a Grand Slam since hard court was introduced as a surface at the US Open in 1978. Consequently, Graf's Grand Slam was achieved on grass, clay, and hard court while the previous five Grand Slams were decided on only grass and clay. Graf reached thirteen consecutive major singles finals, from the 1987 French Open through to the 1990 French Open, winning nine of them. She won 5 consecutive major singles tournaments (1988 Australian Open to 1989 Australian Open), and seven out of eight, in two calendar years (1988 Australian Open to 1989 US Open, except 1989 French Open). She reached a total of 31 major singles finals. Graf is regarded by many to be the greatest female tennis player of all time. Navratilova included Graf on her list of great players. In 1999 Billie Jean King said, "Steffi is definitely the greatest women's tennis player of all time." In December 1999, Graf was named the greatest female tennis player of the 20th century by a panel of experts assembled by the Associated Press. Tennis writer Steve Flink, in his book The Greatest Tennis Matches of the Twentieth Century, named her as the best female player of the 20th century. In March 2012, Tennis Channel picked Graf as the greatest female tennis player ever in their list of 100 greatest tennis players of all time. Graf's Grand Slam tournament breakthrough came in 1987. She started the year strongly, with six tournament victories heading into the French Open, with the highlight being at the tournament in Miami, where she defeated Martina Navratilova in a semifinal and Chris Evert in the final and conceded only 20 games in the seven rounds of the tournament. In the French Open final, Graf defeated Navratilova, who was the world No. 1, 6–4, 4–6, 8–6 after beating Sabatini in a three-set semifinal. Graf again missed the Australian Open after undergoing surgery in December 1995 to remove bone splinters from her left foot. Graf came back to the tour in March, winning back to back titles in Indian Wells and Miami, followed by a record ninth title at the German Open in May. She then successfully defended the three Grand Slam titles she won the year before. In a close French Open final, Graf again overcame Sánchez Vicario, taking the third-set 10–8. Graf had led 4-1 in the second set tiebreak, only to lose six points in a row and force a decider. Twice in the third set Sánchez Vicario served for the championship but was broken each time by Graf. It was the longest French Open women's singles final in history, both in terms of time (3 hours and 3 minutes) and number of games played (40). Graf then had a straight-sets win against Sánchez Vicario in the Wimbledon final. That was the last competitive match Graf and Sánchez Vicario would ever play against one another. In July, a left knee injury forced Graf to withdraw from the Summer Olympics in Atlanta. Graf played only one warm-up event ahead of the US Open, the Acura Classic in Manhattan Beach, California, where she lost to Lindsay Davenport in the semifinals. She then successfully defended her title at the US Open, defeating Monica Seles in the final. Her toughest battle came against rising star Martina Hingis in the semifinal, with Hingis unable to convert on five set points. Graf did not lose a set the whole tournament. She also won her fifth and final WTA Tour Championships title with a five set win over Martina Hingis, with Hingis cramping up in the fifth set. In 1988 Graf became only the second tennis player in history to win a Slam on hard court, clay, and grass all in the same season. She repeated the feat in 1993, 1995, and 1996. Graf wore Adidas apparel and sneakers during her tennis career. She had an Adidas sneakers line known as the St. Graf Pro line. Early in her career, she used the Dunlop Max 200G racquet before switching to Wilson from 1994 to 1999. She first used the Wilson Pro Staff 7.0 lite, then switched to the Pro Staff 7.5 in 1996 and to the Pro Staff 7.1 in 1998. Graf's racquets were strung at 29 kilograms (64 pounds), significantly above the 50-60 pound range recommended by Wilson. In 2006, she signed an endorsement deal with Head. In 2010, Graf and Agassi collaborated with Head and developed the new line of Star Series tennis racquets. In 1997, she left the Catholic Church for "personal reasons". What's the good word on Steffi Graf?